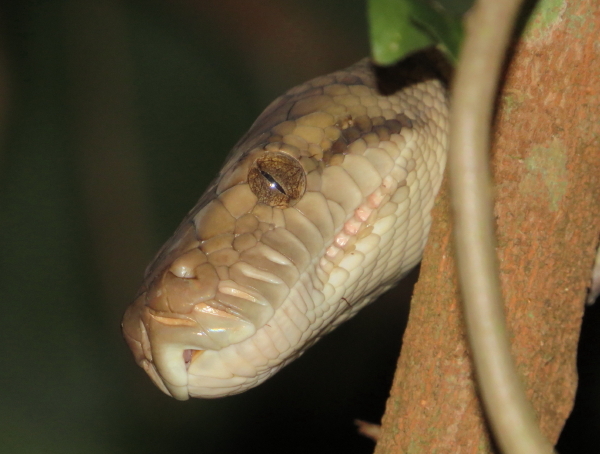 Loud scolding by several species of small birds late in the morning brought a 2 meter long Amethystine python (Morelia amethistina) to our attention. 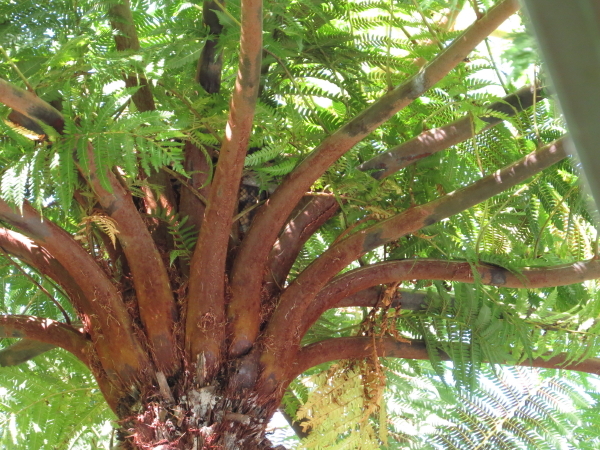 It was making its way up along the frond of a large tree fern, and when it had reached the crown of the fern, it began to coil itself into ever tighter loops until it almost appeared to tie itself into knots! A short while later it had all but disappeared from sight. 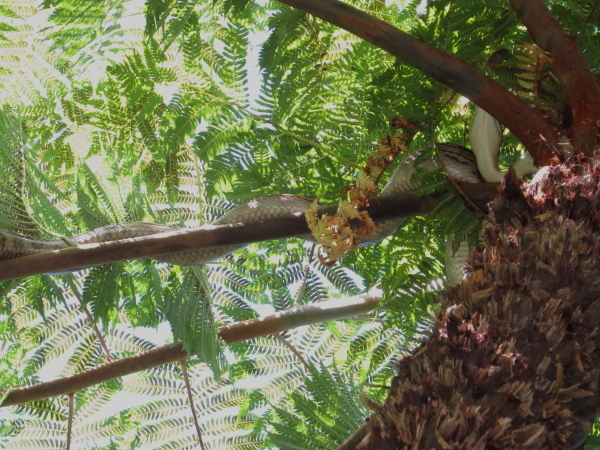 Soaking up the sunshine in its elevated position, it stayed there all day, but in the early evening started to travel down a fern frond, through a fig tree towards our bird feeder, which also attracts small native rainforest rodents during the night -the python probably detected their smell. Yesterday a rare visitor arrived: a juvenile Satin Bowerbird (Ptilinorhynchus violaceus). 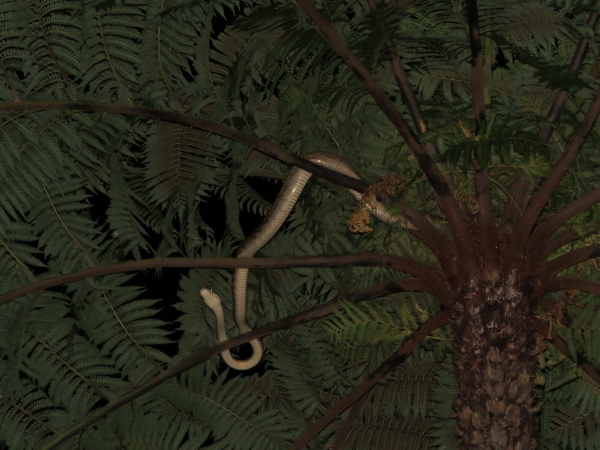 It spent all day opposite our front veranda, nibbling fruit. 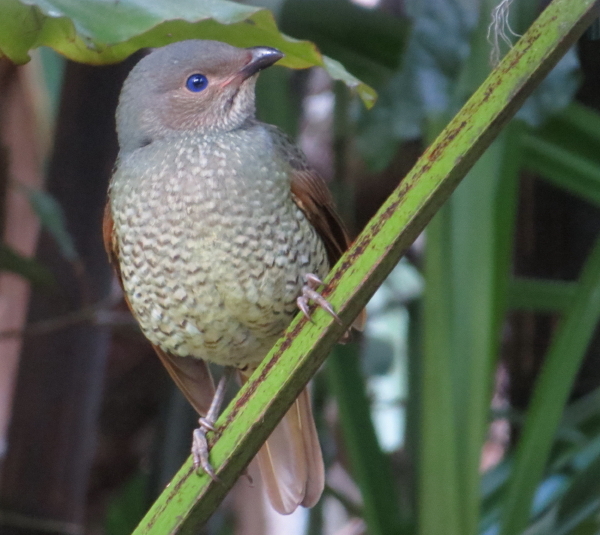 This is our first sighting of this species in Kuranda; Satin Bowerbirds usually occur above 600 meters in north Queensland. 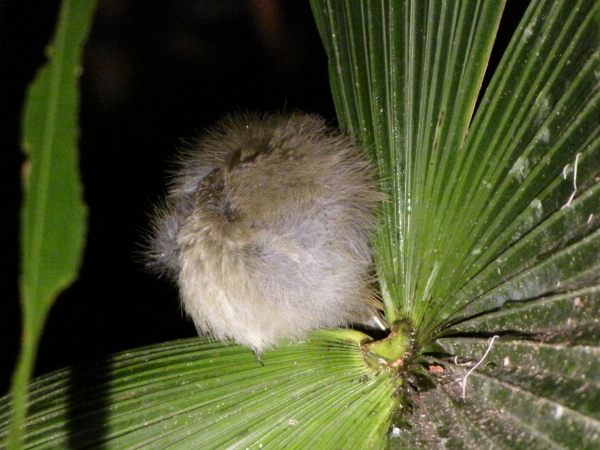 The fruiting Pandanus and palm trees, of which we have many, are attracting several Spotted Catbirds (Ailuroedus melanotis) and Victoria’s Riflebirds (Ptiloris victoriae). 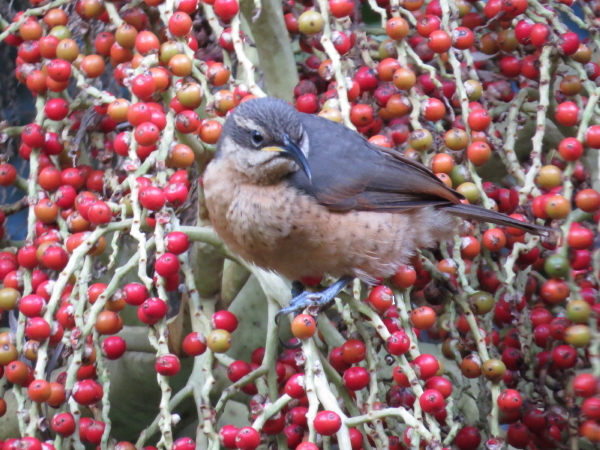 At present we can watch three brown (female or juvenile) and one adult black riflebird in our garden every day. A few weeks ago the first of probably many (last year we had a flock of over 50) Chestnut-breasted Mannikins (Lonchura castaneothorax) arrived; they were joined yesterday by another pair with very demanding and vocal offspring in tow. 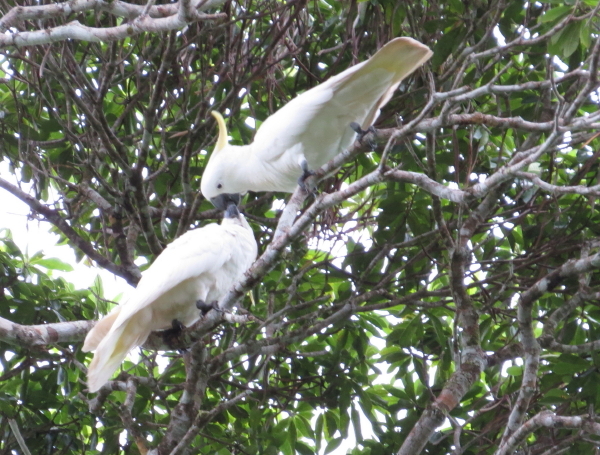 A rather enervating youngster, a juvenile Sulphur-crested Cockatoo (Cacatua galerita) is keeping its parents busy regurgitating food with a constant, demanding wail. 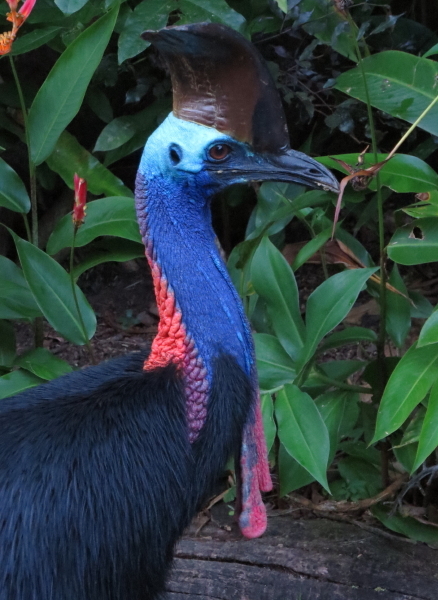 Unfortunately, last week the resident female was killed by a vehicle on Black Mountain Road . 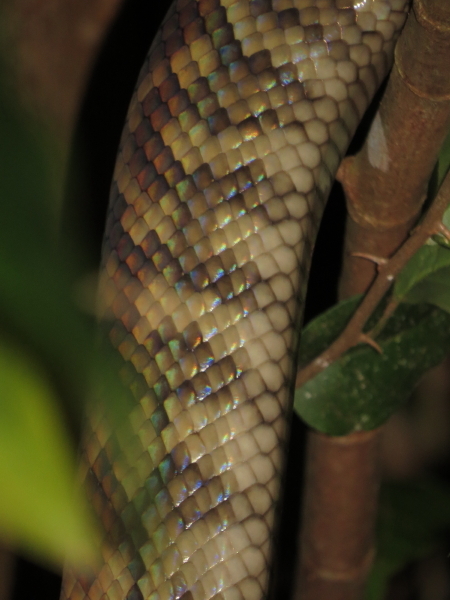 As Dad has not made an appearance over the last two weeks, our hope is that he is currently sitting on her eggs, at least partly keeping her genes in the pool (they had been mating for the last few weeks). She had only replaced Dad’s partner of many years, “Missy”, last year, and was in the prime of her life. Missy is still in the area and will, hopefully, mate with Dad again. Beautiful photos of your beautiful visitors! Sorry to hear about Dad’s girlfriend though.